FFT is a weekly meme hosted by Todd Mason at his blog, Sweet Freedom. So don't forget to head on over to link central and see what films, television or other audio/visuals, other bloggers are talking about today. We're an eclectic bunch. When you think of legendary director Howard Hawks, the first film that doesn't pop to mind is LAND OF THE PHARAOHS, a sun, sand and slaves pot-boiler written by (yes, it's true) William Faulkner (and two other lesser known writers). The film has a heart-pounding (and strangely catchy) musical score by the one and only Dimitri Tiomkin to recommend it as well. 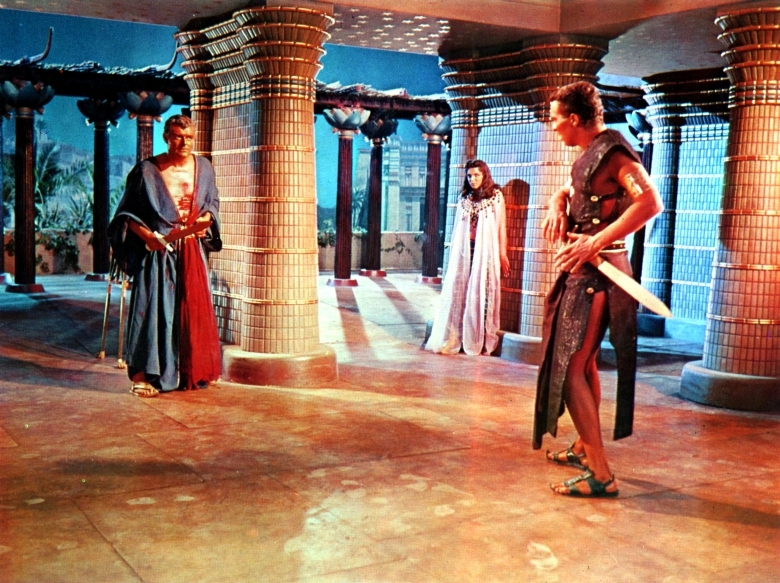 It was shot in Egypt and in a Rome studio, and had a cast of thousands, literally. This was back in the good old days of spectacular epics ala BEN-HUR, THE TEN COMMANDMENTS and whatnot - when this sort of thing was feasible. 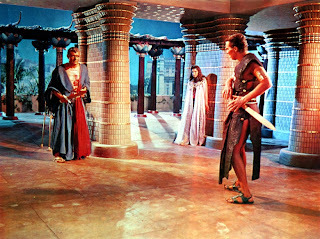 Three creative giants + ancient Egypt = one mighty fine B-movie mash-up in startling Technicolor. 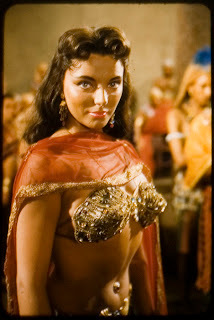 Can anyone take Joan Collins seriously as Princess Nelifer, captured desert royalty dropped at Pharaoh's feet and almost immediately doing her undulating best to win him over to her bed and his board? Not really. But what the heck, it's so much fun to watch her work her slinky wiles around the palace - a heavy breathing femme fatale with murderous inclinations and a mummified heart. Not to mention, a great deal of body make-up. It's that little jewel in her belly-button that does it. How can Khufu resist? 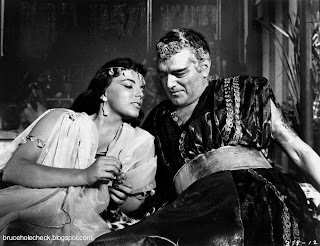 The hapless Pharaoh Khufu (or Cheops) is played by British stalwart, Jack Hawkins, a fine actor here called upon to play second-banana to a naughty chit of a girl out to rule Egypt by hook or by crook. He mostly holds his own and one wonders what was going through his mind in some of the scenes where he must fall victim to the evil machinations of a teenage temptress in skimpy attire and a piquant pout. The Pharoah, you see, is mostly concerned with the trappings of his after-life though attention to his rampaging libido might have served him to better purpose. Yes, he falls for the vampish allure of the bad tempered little princess. No big surprise there. The randy Pharaoh can't believe his good fortune. He makes her his number two wife. But unbeknownst to Pharaoh, she is determined to be number one. Really, you'd think the guy would catch on, I mean he's a grown man, a warrior, a feared and beloved leader of a nation, an Egyptian god, for goodness' sake - presumably he has been around the block a few times. But no, he is putty in Princess Nelifer's capable hands. Men. Sometimes you just have to shake your head. 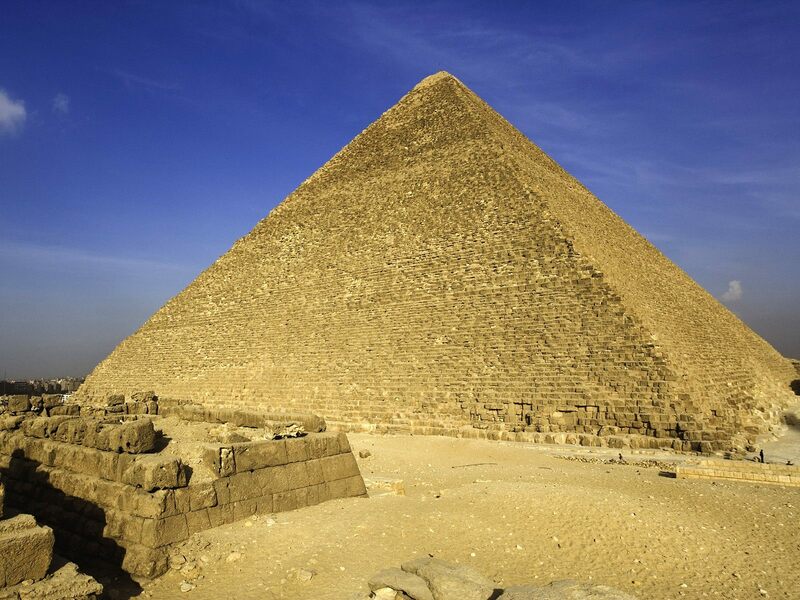 The soap opera doings of the Pharaoh and his bride are played out against the work of building the great pyramid of Egypt. The tomb of this particular man/god consumes Khufu night and day (when he's not being consumed by....well, you know) and to that end he is fortunate enough to have, among his captured slaves, Vashtar, an architect (played by the always imposing James Robertson Justice). If you make my tomb safe from looters, you'll die anyway, but your family won't. Vashtar is put to work designing some sort of fail-proof mechanism that will prevent looters from ever entering the final resting place of Khufu. His son Senta (Dewey Martin) is there to help as well. Vashtar must take an oath not to reveal the secret of the tomb to anyone and upon the death of the Pharoah and his placement in the tomb, Vashtar's son and family will go free. (If I'm remembering correctly. It's been a while since I saw the movie.) But Vashtar must die so that the secret stays safe for eternity. Sounds like a plan. Of course, the best-laid plans of mice and men, you know how that goes. In the meantime, while thousands of slaves toil in the hot desert sun, Princess Nelifer is up to no good behind gilded palace walls. In her plot, she engages the smoldering attentions of a weak-willed palace guard (Sidney Chaplin - son of Charles). Ah well, nothing lasts forever. It's all very opera-worthy and Dimitri Tiomkin makes extra sure to musically define all the heavy-breathing and chicanery. The only thing missing is the singing. No wait, we get a singing chorus made up of crowds of Egyptian subjects who gather to hail the Pharaoh alive or dead. I still remember the tune. I did say some of the music was catchy. Oh, and the minister allows the architect (now old and blind) and his family their freedom, since he reasons, rightly, that once the mechanism goes into play in the pyramid, it doesn't matter who knows what. It will be impregnable. A mighty fine B-movie epic and I'm told that the color of the current dvd is brilliant - always a good thing. It's on my queue as we speak. Link to the movie's trailer which shows very dark. I hope the dvd doesn't follow suit. Oh, I remember the ending of this one...with Joan certainly getting her just desserts! I remember nothing else about it, but Joan's demise. Yvette, your reviews are as entertaining as the overlooked films you pick. Enjoyed it! Especially the line "a heavy breathing femme fatale with murderous inclinations and a mummified heart." Never liked Joan Collins, maybe "Dynasty" had something to do with it. This just went to the top of my Netflix queue. I love stuff like this. I watch The Ten Commandments every time it's on, but only until Moses decides to leave the Egyptian court, because after that it's not very glamorous. 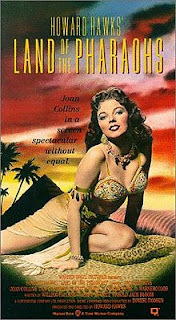 I require a constant glamor quotient in my 50s technicolor epics, darn it. Another one from the B-archives, Yvette. I may have seen this one or may not; I cannot remember. In my time I have seen a few of gems from Ms. Collins, but this one may be worth another peek. Mmm, what could be a tastier snack on a summer's day than ripe cinematic cheese served up by a fine cast, and who wouldn't want to see Joan Collins get her just desserts in dramatic ways? :-) Yvette, as always, your post on LAND OF THE PHARAOHS is great fun to read! 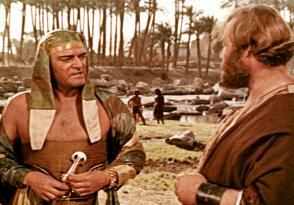 Hollywood's version of Biblical times and ancient history always amount to unintentional laughs. Did audiences take this stuff seriously when these movies were first released? Never seen this, don't think I'm interested as I've grown weary of this genre [unless walking mummies are part of the story] ;^) But your review was an absolute hoot! Thanks, Sergio. Yes, I've always had a sneaking affection for this pot-boiling epic. Haven't seen it in a while though. Hence, it's position on my queue. Oh she's so evilish in this one. Puts DYNASTY to shame. Ha! Thanks, Prashant. Glad you enjoyed it. I require a glamor quotient too, Lauren. Ha! I know what you mean about THE TEN COMMANDMENTS. Oh, I suddenly remembered that Jack Hawkins was in BEN-HUR. The sight of Stephen Boyd in that quilted Roman soldier under garment is ingrained in my memory. Hubba hubba. It's such a funny story that Charlton Heston wasn't told that Boyd was to play his part as if he had the hots for him - Ben Hur. I always keep that in mind when I few the few scenes in the film I still like. And of course, there's that breath-taking chariot race near the end. Fabulous. Thanks, Dorian! If you haven't seen this, drop everything and add it to your queue. You and Vinnie will enjoy it but probably for different reasons. Ha! This one is so much fun, though. Now, looking back.